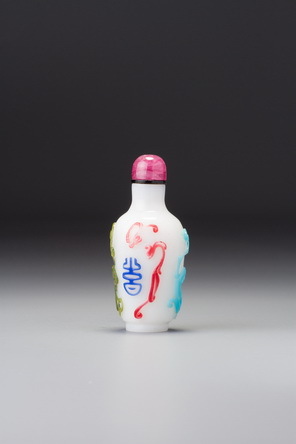 In the fairly large series of bottles exhibiting this general design concept, the entire bottle is rendered as a formalized lotus flower resting in a leaf. Several in the series are of modified meiping (‘prunus-blossom vase’) form, while others are of double-gourd form. Both of these were popular at court, which, together with the numbers involved, suggests the likelihood that the imperial glassworks was their source. For an extensive list of related bottles, see the commentary for Treasury 5, no. 818. This was obviously a popular imperial design, and the Qianlong period seems most likely for their production, although this may have carried over briefly into the nineteenth century. They are universally well carved, varying in shape sufficiently to suggest an original design concept, rather than a particular model, being repeated. Thus, although there may have been a fashion for them, perhaps in the early to mid-Qianlong period, the idea was probably repeated over a greater period of time. The concentric rings of the sandwiching at the neck prove beyond doubt that the bottle was blown, presumably into moulds, since that seems to have been the common practice. The degree of surface carving is so great, however, that any trace of a mould has ended up as mud on the lapidary’s floor—quite literally, since the lapidary process involved water as a cooling agent. Thus a pleasingly apt metaphor is provided for the symbolism: the lotus form emerging from the mud of the lapidary process. The thin layer of sandwiched pink in this example is achieved by trapping a thin layer of powdered pink glass between two layers of thicker glass, the upper one of which must be either transparent or translucent. 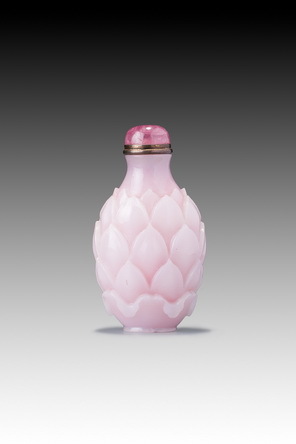 The petals are beautifully scalloped to give greater conviction to the shapes, a feature shared by all the bottles in this series, although in this example the carving is in slightly deeper relief.